Former Ultimate Fighting Championship competitor Justin Levens, 28, and his wife Sara McLean-Levens, 25, were found dead in bed in their Laguna Niguel, Calif., home Wednesday afternoon, police say. Both had gunshot wounds to the head. "This is a possible murder-suicide with him being the shooter," says Orange County Sheriff's Department spokesman Jim Amormino. "We also confiscated some prescription drugs found in the home, mostly pain-killing and anti-depressant type drugs, but we don't know whose name they're in or if there were prescriptions for them." Amormino adds that no suicide note was found, and that an unknown-caliber handgun was retrieved at the scene. "The reason why it's a possible murder-suicide is because of the position of the bodies as well as the weapon found," Amormino says. The couple had been married for about a year, and were found by the wife's mother, who hadn't heard from her daughter in five days, according to Amormino. The wife's mother discovered the bodies Wednesday afternoon and called 911. Autopsies were being performed Thursday, and further tests are being conducted. "There's still more work to do," Amormino says, adding it's unclear if Levens had a criminal history. The deaths come four months after another tragedy in the mixed martial arts world: In September, fighter Evan Tanner was found dead in the desert. 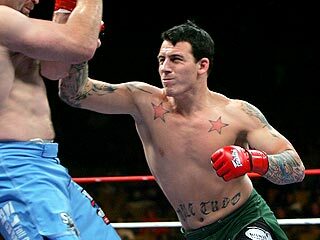 Levens lost to Tanner in a UFC match in 2006.